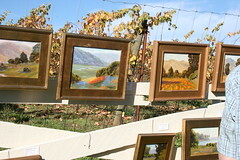 Art on the Farm: Art on the Farm Weekly...8 Days to our Annual Group Showat Pt. Reyes Vineyard Inn & Winery! at Pt. Reyes Vineyard Inn & Winery! A week from tomorrow! OCT 24, SUNDAY.... We want you to come. 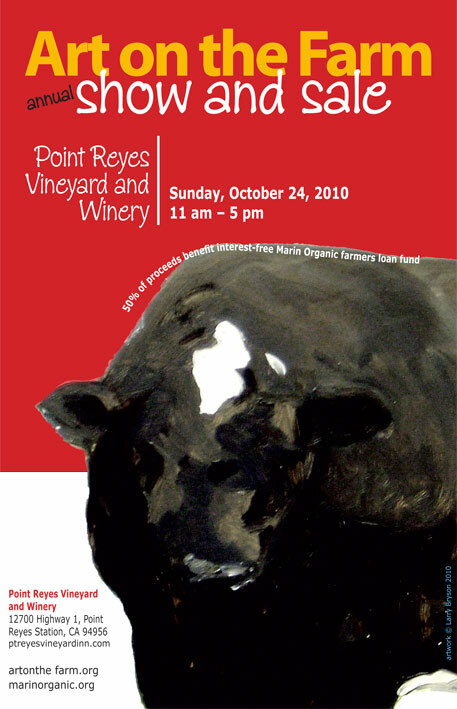 We want you to love the gorgeous vineyard, the delicious wine, oysters, the art by our local artists created on Marin Organic Farms or inspired by visits to these farms... We want you to hear Dianne Zellers singing Jazz, and jazz guitar, rolling over the hills and down to Tomales Bay, where the cows graze in the hazy light, misted by the fog rolling in from the coast. 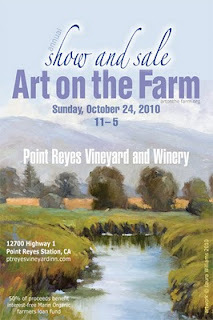 We want you to come for this once a year event, where paintings are hung on hay bales, and ranch fences. Where all the artists come for the day, and enjoy being together. Here is a Google map... Put it in your cell phone now, and don't miss this once a year event to raise money for the Marin Organic Farmer's Loan Fund. 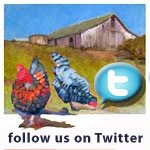 Thank you, and see you on the Farm! View our photos from last year's event here.